Cranberry sauce seems to be the type of side that is a love or a hate for most people. I was never very into it, until I had cranberry sauce made from scratch. Out of a can, it just didn't do it for me. Now I am a huge fan. But as good as it is fresh, I thought it needed a little twist. Put water and sugar into a saucepan and bring to a boil. Add cranberries and cinnamon stick. Bring it back to a boil for just a minute, then put it back to low so the berries won't burst. Add orange juice and zest. Simmer for 10 minutes. Take off heat and chill in the refrigerator. 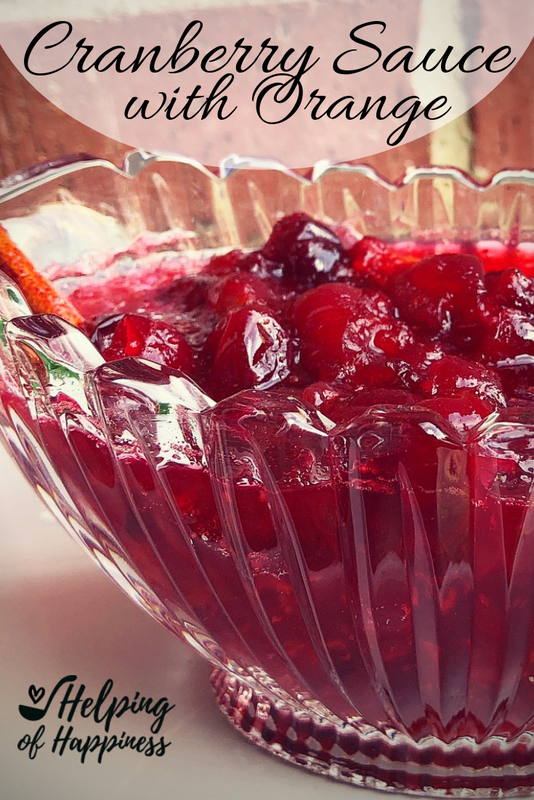 One of the great things about cranberry sauce, is that it is basically a jam- so you can make it way ahead of time. I've found that I enjoy it even more on ham than I do on turkey. It's also amazing on a pork roast cooked in a slow cooker. And if you have leftover cranberry sauce (which it seems like we always do), you can use it in muffin recipes in place of blueberries. I love cranberry orange muffins. I'll have to get a post together for you with my recipe. When we lived in California, my father in law had this amazing orange tree. He guarded those prized oranges like a fierce doberman. And that is really saying something, because I don't think he has a mean bone in his whole body. But pick one of his gorgeous oranges, and watch out!! I know he was known to chase some unsuspecting kids down the street who had disturbed his crop. I'm not sure if he sang to that tree every night before bed, or if he whispered loving words to it during the day, but whatever he did, that tree made the sweetest most gigantic oranges I've ever eaten. They always seemed to peak at Christmastime, and he would very generously bestow some of his precious bounty upon us. They were truly divine. So one year, I decided to use his oranges in my cranberry sauce. I added some orange juice to the cranberry sauce in place of water. Oh, what a difference!! It was not only delicious, but the prettiest thing on the table!! We no longer live in California, and my dear, sweet father in law is fighting a losing battle with Dementia, and is no longer able to tend his beautiful orange tree, or the rest of his remarkable garden. Just remembering how he used to be, and the kindness he always showed to me brings tears to my eyes. But I'm thankful that this time of year will always remind me of him, and the sweet gift he is in our lives. There was a short time before his illness, after we moved away from California, that he would still mail us oranges- all the way to Texas. I'm sure it was a huge expense- those juicy things were heavy! He also would make sure to put some pomegranates in the box as well. Sometimes from his own tree, and sometimes ones he would barter and trade with his other gardening friends. The things I miss most about living in California are the people and the produce. We made such wonderful friends there. And the strawberry stands- don't get me started!! So if you think you're a cranberry sauce hater- maybe give it one more try?? ?